^ kasø. 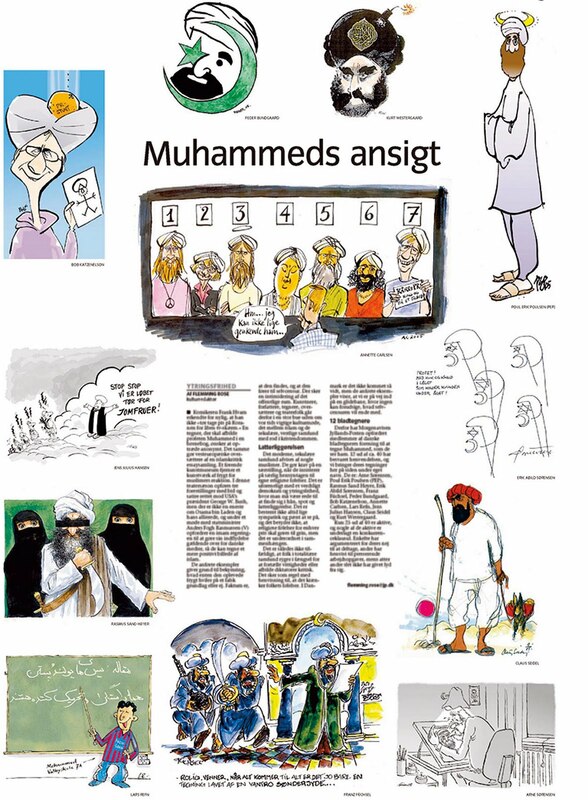 Tidslinie: Muhammed-sagen. tv2.dk. 2006-01-30. （原始内容存档于2006-06-15）. ^ Response by the Danish Government to letter of 24 November 2005 from UN Special Rapporteur on freedom of religion or belief, Ms. Asma Jahangir, and UN Special Rapporteur on contemporary forms of racism, racial discrimination, xenophobia and related intolerance, Mr. Doudou Diéne, regarding cartoons representing the Prophet Mohammed published in a newspaper (PDF). 2006-01-23. （原始内容 (PDF)存档于2009-03-25）. ^ 黄文惠. 漫画风波蔓延 大马华文报纸遭禁. BBC中文网. 2006-02-14. ^ Cartoon protests escalate in Pakistan. The New York Times. 2006-02-15. ^ Ali Akbar Dareini. Iran Renames Danish Pastries. Associated Press. 2006-02-16. （原始内容存档于2006-03-01）. ^ 伊朗抗議諷刺漫畫事件別出心裁,將丹麥酥餅更名為"先知玫瑰". 雅虎香港. 2006-02-15. （原始内容存档于2006-02-17）. ^ Europa veroordeelt het cartoongeweld. VRTNieuws. 2006-02-15. （原始内容存档于2006-02-21）. ^ 意大利部長穿辱回漫畫上衣. 雅虎香港. 2006-02-16. （原始内容存档于2006-02-19）. ^ Thousands in Pakistan join protests of cartoons. The New York Times. 2006-02-16. ^ Muslim cartoon row timeline. BBC News. 2006-02-19. ^ Pakistan crackdown over cartoons. BBC NEWS. 2006-02-17. ^ 意部長穿褻瀆漫畫上衣辭職. 雅虎香港. 2006-02-19. （原始内容存档于2006-02-20）. ^ 諷刺漫畫風暴延燒奈及利亞16死;兩部長下台為利比亞抗議衝突負責. 雅虎香港. 2006-02-19. （原始内容存档于2006-02-20）. ^ OIC denounces cartoons violence. BBC News. 2006-02-21. ^ 尼日利亞宗教暴亂24人亡. 雅虎香港. 2006-02-22. （原始内容存档于2006-03-06）. ^ 施泰芬·莱德尔. “西方应该反思！”. 德国之声中文网. 2007-08-15 [2007-08-15]. ^ Protests Spread to Pakistan Over Reprinting of Muhammed Cartoons. BlogBurst (reuters). 2008-02-15 [2008-02-25]. ^ Pakistan blocks YouTube for 'blasphemous' content: officials. AFP (Yahoo News). 2008-02-24 [2008-02-25]. （原始内容存档于2008-02-28）. Muhammad Cartoon Gallery [穆罕默德漫画廊]. 2006-02-02. （原始内容存档于2006-07-19）.